Are you BRAVE enough to take a dip into the 30 degree bay? Every January over 10,000 courageous plungers head to Sandy Point State Park seeking thrills and chills all to benefit the 7,782 athletes of Special Olympics Maryland. Join us in the Rams Head Ice Lodge for live music and drinks as you prepare for the chilly dip! This heated tent is the perfect place to warm-up, celebrate, and enjoy Maryland's largest winter festival! 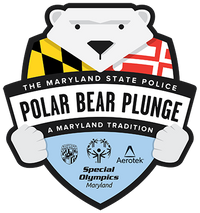 The MSP Polar Bear Plunge is a fundraising event in which individuals pledge $75 or more for the privilege of plunging into the Chesapeake Bay in January in support of 7,782 athletes around Maryland.